The word “Islam” comes from the Arabic roots sa-la-ma, meaning peace and submission. 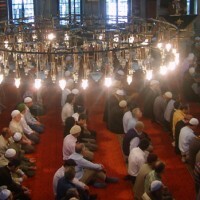 In the religious sense, Islam means “actively achieving peace through submission to God (Allah).” Based on this definition, all of the great Prophets and Messengers, such as Adam, Abraham, Moses, David, Jesus and Muhammad (peace be upon them), and those who believed in them were followers of Islam. Islam therefore is not an ethnic religion but a way of life expressed in all parts of the world. Islam, in essence, is a qualitative term that values submission to the Supreme Being above the ideas and whims of humanity. A Muslim is one who seeks that peaceful existence through submission to the Creator. This does not mean that a Muslim gives up his own culture but merely conforms his lifestyle to the universal principals of Islam for the love of God and to live in peace with all beings. A Muslim can live in any climate and in any part of the world. Muslims are Asian, European, African, Middle Eastern, Chinese, Aboriginal, Native American and so forth. There are more than a billion Muslims in the world today. They live in virtually every country and are represented in every race. Islam is not an organization, cult, secret order or fraternity. Even a person living in the Amazon rainforest who believes in One God and lives a righteous life in harmony with nature is in essence a Muslim. There is some Islam in all of us but not all of us have learned to recognize it and implement its lifestyle. For Muslims, this Divinely revealed way of life is the most important knowledge that people can acquire. Given the unprecedented attention that is paid to Islam, it could benefit every person to take some time and investigate what this way of life is truly all about. Meeting Muslims, face-to-face, and hearing about Islam from its original sources leaves a much different impression of Islam than what is generally portrayed in movies or shown in mainstream media. In this globalized world where we are likely to meet a variety of individuals from disparate backgrounds, it is important that we not rely on misrepresentation and stereotypes. It is necessary to be educated about the people around us. Islam is based on five important foundations that act as pillars of the faith. Monotheism (or “tawheed”): All actions of a Muslim should be based on sincere submission to the One God, the Creator and Sustainer of life who initiated creation and has no physical needs or earthly desires. This concept can be found in many religions and even the word, Allah, is used for Jehovah (God) by Christian Arabs in the Bible. Prayer (or “salaah”): The most important expression of faith for a Muslim is prayer. This takes place at least five times per day. Muslims also pray in weekly congregation each Friday. The call to prayer can be heard daily from local mosques but personal prayer can be performed at home, school, on the job in any clean place. Charity (or “zakaat”): Giving to the poor and needy is considered to be one of the most important duties in the life of a Muslim. Special emphasis is also given to orphans, travelers, debtors, the weak, and those who have recently embraced Islam. Fasting (or “sawm”): Fasting to gain the consciousness of God and freeing ourselves from our unhealthy appetites and desires. One month per year (called “Ramadan” in the Islamic lunar calendar) is dedicated to abstinence from eating, drinking and marital relations during the daylight hours. Children, pregnant or breastfeeding women, travelers and the sick are exempted from fasting. Pilgrimage (or “hajj”): Pilgrimage to Makkah takes place in the 12th month of the Islamic lunar calendar. It is required of every mature, capable Muslim once in a lifetime if health and finances permit. Great respect is shown to those who have completed this duty for they have witnessed the whole of humanity in united expression of love and worship of the Divine. Muslims are exhorted to live life based on sincerity, love, mercy, honesty and forgiveness. These teachings put them on the path of all of the prophets and righteous people from the beginning of time.